Of all the ritual tools I possess, the most important one isn’t even really a tool at all, since it’s intangible. I have a hard time calling it a technique, since it’s not really a skill and it’s something I have to work with in order to make use of, like a resource. It’s the matter of timing, and it’s crucial to much of my magical and devotional works. Whether it’s being as specific as timing something to a 30min window for a rare astrological election or just being lazy and doing something at some point during a week of the waxing moon, timing is something that can easily make or break a good ritual, so it’s important to understand the rules of occult timing properly for any magician. Any ritual, heck, any activity whatsoever can be augmented and benefitted from looking at a clock and using a few mental rules or simple charts, from conjuring one of the cosmic leaders of creation to organizing your wardrobe; it pays, sometimes handsomely, to learn how to time things magically. By far, the most common system I’ve seen of occult timing is the system of planetary days and hours, which is such common knowledge among Hermetic magicians and traditional astrologers that I don’t see a need to rehash it in full here. Suffice it to say that each of the seven traditional planets (Moon, Mercury, Venus, Sun, Mars, Jupiter, Saturn) are each associated with one of the days of the week (Sunday with the Sun, Monday with the Moon…). Each planetary day starts at sunrise, and there are 12 diurnal hours (1/12 of the total time between sunrise and sunset) and 12 nocturnal hours (1/12 of the total time between sunset and the next sunrise); each of these are assigned one of the planets, as well, in a repeating order. Times when the planet of the hour matches the planet of the day are exceedingly good for working with that planet, such as conjuring the angel or daimon presiding over the planet, while combinations of different planetary hours with different planetary days can yield interesting and refined times for specific acts (a la Jason Miller’s Advanced Planetary Magic). This system of hours and days may look complicated, and if you’re having to calculate it all out by hand then it can be a headache at times, but there are plenty of tools to help you calculate planetary hours, so you don’t really have an excuse to be ignorant of them. This system has been used for over a thousand years, and comes up time and time again (sorry I’m not sorry) throughout Western occult literature, so it behooves you, dear reader, to become familiarized with the system if you’re not already. Remember, however, that you can’t have the planetary hours without the planetary days, and the planetary days is a repeating cycle of seven. Seven is quite a popular number in occulture, spirituality, religion, and mysticism, and the system of planetary hours/days is a complete system on its own that can augment anything and benefit anyone. 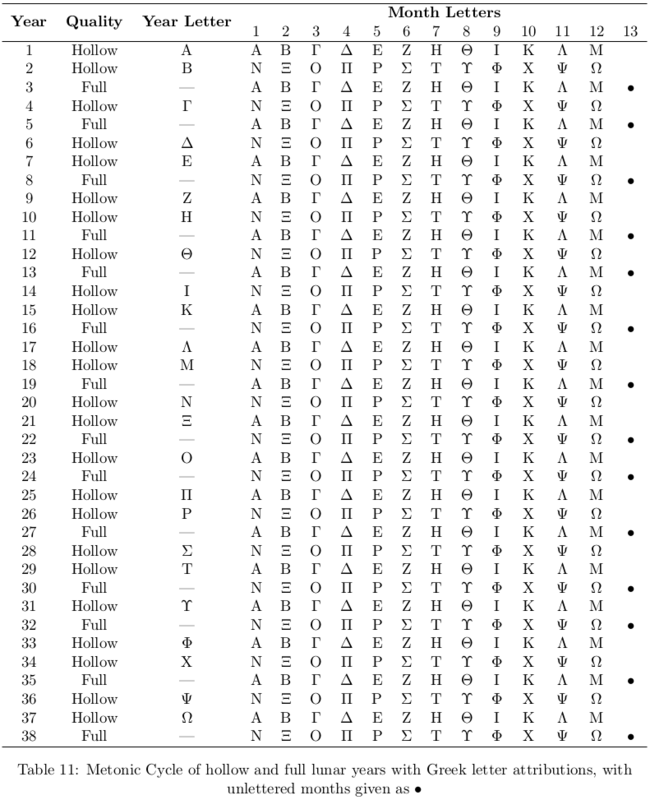 The problem I have, however, is that I’m starting to use a totally different cycle of timing, my lunisolar grammatomantic calendar for Hellenic and mathetic rituals. 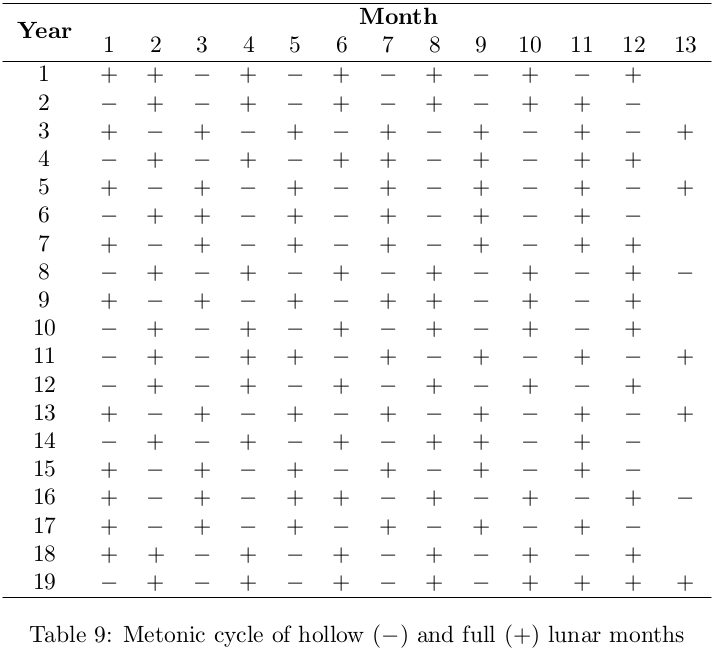 This is a cycle of 29 days (in a hollow month) or 30 days (in a full month) following the passage of the Moon in its synodic month, where there are three decamerons of 10 days, with the final decameron having 9 days if it’s a hollow month. In each decameron, eight of the days are associated with one of the 24 letters of the Greek alphabet, one of the days is given to one of the three obsolete Greek letters, and one of the days is unlettered (with this being the omitted day in hollow final decamerons). I’ve been using this calendar for great effect lately in doing my mathetic letter meditations, scrying sessions, and rituals with the Greek gods above and below, and it’s a system I plan to continue using and refining as I continue developing it and my own mathetic practice. The issue arises when I try to combine the two systems; it doesn’t really work. Neither 29 nor 30 are multiples of 7, so they don’t really overlap except in complete cycles of each other (so thirtyish weeks or sevenish lunations, and the lack of specificity and exactitude here bothers me). Add to it, the grammatomantic calendar doesn’t prescribe offerings and sacrifices on the days associated with the seven vowels, instead giving them to the seven planets themselves. Thus, the first day of the lunar month, the Noumenia, is given to the letter Α, and thus to the planet of the Moon, regardless of what the day of the week might say it is; same case for the fifth day being given to Ε and thus to Mercury, and so forth. Thus, the grammatomantic calendar affords another kind of planetary association to the days, though much more spread out than the system of planetary days. It’s not something I’ve fully explored yet, being used to the system of planetary days and hours, but I plan to in the near future. The problem, as you might have guessed, is that these systems don’t overlap very often. For instance, if the Noumenia is the day associated with the Moon, and we’d like to find Noumeniai that are on Mondays to link the planetary day of the Moon with the grammatomantic day of the Moon, the next one is coming up on Monday, December 22, 2014; the next one after that is Monday, September 14, 2015, nine months apart! Add to it, the system of planetary days and hours is pretty much a solar system, timed according to the rise and set of the Sun in patterns of seven. The grammatomantic calendar (which I really need to find a shorter name for, perhaps γραμματημερολογιον, “grammatēmerologion”?) is lunar and follows its own patterns, which are frustratingly irregular by solar notions of the passage of time. The two systems, simply, aren’t compatible to be mixed like that. This only gets worse once we start reckoning letters for periods longer than a day. For instance, the lunisolar grammatomantic calendar can give a letter to every lunar month, as well, but note that, because of the mismatch between the number of days in a synodic month and the number of days in a year, some years will have 12 months (hollow years) and some will have 13 (full years). If we assume that every year has 12 months, then we assign every month in a two-year period one of the Greek letters in order, with the thirteenth month in a year receiving no letter. How do we figure out which years need 13 months and which only need 12? We look to the Metonic cycle of 19 years, 12 of the years being hollow (12 months) and seven of the years being full (13 months) in a particular order. If we use a dual Metonic cycle of 38 years, then we have 24 hollow years interspersed with 14 full years. We can assign all the hollow years in the dual Metonic cycle a Greek letter in order, leaving the full years unlettered. However, with a month of 29 or 30 days, a year of 12 or 13 months, and a cycle of 38 years, none of this can be easily matched up with a system of seven days. Thus, if one dual Metonic cycle starts on a Monday (year Α, month Α, day Α all falling on a Monday), the next time that will happen is in approximately (but maybe not exactly!) 266 years, which is 7 × 38. A rare occurrence, indeed! In that light, let me qualify my previous statement: the system of planetary days and hours, on its own without considerations of other systems of time, can be used by anyone to benefit everything, given a more-or-less Western or Hermetic understanding of the cosmos with seven planets. The grammatēmerologion system uses the same seven planets, but is otherwise incompatible with the system of planetary days and hours. Thus, they can’t really be used in tandem except by happenstance unless you have months (at a minimum) or centuries (if you want the whole shebang) to wait for a syzygy of letters and planets and days to occur. I admit that I’m a little grieved by this, but I can’t say I’m completely surprised by the result. So where does that leave us? Honestly, my best solution is that it doesn’t matter. So what if the systems don’t match up right? They don’t need to! They’re independent systems working on their own; there’s nothing wrong with that. The system of planetary days and hours, of course, is definitely vetted and used across Western occulture, and it’s both simple and highly refined to achieve powerful results all on its own. The grammatēmerologion system works, although it is experimental and used pretty much only by me and my household, yet calls upon the same forces. So what if it calls for lunar rituals on a Tuesday? According to the grammatēmerologion system, we don’t even have Tuesdays or any of the other days of the week; we have decamerons of ten days each based on the phase of the Moon, not (what might plausibly be argued) artificial cycles of seven days. A debate between the theoretical efficacy of planetary days and hours versus that of grammatēmerologion is akin to arguing which set of elements is better to use, the Empedoclean/Western set of four or the Chinese system of five. Arguing about it doesn’t make sense, since there’s no common ground to link the two together and compare or contrast against. Now, this doesn’t mean I’ll break out my conjuration tools and call down Gabriel at sunrise on a Tuesday just because it happens to be the first day of the lunar month. Planetary conjurations in the Trithemian-Solomonic-Hermetic system make use of the system of planetary days and hours, and I’m not one to force Gabriel to work with a system that he (nor the enclosing system he finds himself in) hasn’t vetted or agreed to. Yes, I can just conjure Gabriel during a planetary hour of the Moon on a Tuesday, but that’s still relying on planetary hours and days. Rather, in order to stick with the grammatēmerologion system in mathetic ritual and that system alone, a different approach to working with the planetary energies and forces is suggested here, one that can work with the seven planets as understood in Hermeticism as well as not being tied to the system of planetary days and hours as much of Solomonic work tends to be. That’ll afford a deeper area of research, which can easily tie into my devotions as well as other offerings and sacrifices made throughout the rest of the grammatomantic lunar month. Early last year, I devised a five-week conjuration cycle that has me conjure the angels of the seven planets, the angels of the four elements, and my natal genius. In each conjuration of each of these forces, I’d spend time soaking in the light and power of that particular sphere, reconsecrating and recharging whatever tools or talismans I have, meditating on that force’s symbols, and asking for specific or general advice about where to go or what to do next. It’s a neat system, although one I didn’t stick to as well as I ought to have. I did it a couple of times, and recently went through all the angels in consecutive days, which was also a blast and pretty powerful (and what Frater RO and a good number of other guys keep doing just to say they can). However, a lot can happen for a beginner like me in the space of a year: I’ve gotten in contact with my HGA, I’ve started an involved devotional practice to Hermes, I’ve started doing weekly readings and occasional classes at the local new age shop, and I’ve picked up a few more rituals and works here and there that need to be done every lunar month or so. Basically, I’ve got work to do, and having a schedule to organize it and put it on my calendar to bug me about it on my phone and all is kinda important now. So, in effect, I have two interlocking cycles, a 5-week planetary cycle for conjurations and some devotions and a 4-week lunar cycle for other devotions and works. The five week cycle is mostly the same as before, going through the planetary angels in descending order (Saturn, Jupiter, Mars, etc.) on their respective days and hours, with the four elemental angels sometime around midday on the Wednesdays not working with Raphael of Mercury. This way, I have two or three conjurations a week, which isn’t bad for constant upkeep. The big change to the conjuration cycle is that I’m not explicitly conjuring my natal genius anymore. Instead, I plan to perform the Headless Rite with some extra bells and whistles, using the Light from the ritual to hold a conference call between my natal genius, my HGA, and the angel of my occupation (the third of the threefold keeper of man that Agrippa speaks about in his Third Book of Occult Philosophy). On Sundays, I spend more time in contemplative prayer and repentance, as well as making offerings to the solar-ish healing god Asclepius. I also like to incorporate the Headless Rite into my normal routine, just to bask in the Light from the ritual as well as touch base with my HGA (who has largely supplanted my natal genius in responsibilities) to make sure I’m doing the right thing and doing it right. On Wednesdays, I make offerings to the spirits of my home and land as well as perform a weekly devotional to Hermes, as well as performing a variation on the Litany to the Holy Archangels written by Michael Seb Lux. I also like to do divination readings on Wednesdays in an hour of Mercury or of the Moon (my work-from-home days, which gives me a lot of time to work on my Work). On Thursdays, contemplation and an invocation of the forces of Jupiter to fill and bless my life’s work and fortune. This started out as an instruction from Tzadqiel, the angel of Jupiter, to continue until further notice due to a Jovial issue in my own sphere (Jupiter is badly detrimented in my natal horoscope). Omitted on weeks I conjure the angel of Jupiter (subsumed into the conjuration of Tzadqiel). On Saturdays, contemplation and an invocation of the forces of Saturn to protect and structure my life’s boundaries. This is due to Saturn’s oddly dignified nature in my natal horoscope, permitting it to be one of the most favorable forces for me to work with (and to temper the malfunctioning Jovian force being done with the weekly observances). Omitted on weeks I conjure the angel of Saturn (subsumed into the conjuration of Tzaphqiel). Just to give myself a break, I’ll probably space each 5-week cycle out by a week, having it be six weeks in total. This is probably unnecessary and a willingness to be lazy on my part, but it will help me maintain a healthy social and romantic life, not to mention giving me a break to keep tabs and wrap up anything down here that needs wrapping up before more conjurations need doing. The other cycle is lunar, going by the phases of the Moon. Only a few things happen with this (so far): the big ones are the Hermaias, my monthly devotionals to Hermes. Hermes is associated with the fourth day after the new moon, so on that day at dawn I’ll make an offering of food, incense, prayer, and the like to him. Conversely, though it’s not attested elsewhere, I’m also honoring his chthonic, underworldly aspect on the fourth day before the new moon (as a kind of reversal or switch), where I’ll make offerings to the spirits of the dead and act as psycopomp with Hermes’ help. I’ll do a ritual for the Full Moon sometime around midnight when it’s full, and do a quick offering and ritual to the stars of the Big Dipper from the Greek Magical Papyri (PGM VII.686) when it’s new. Beyond that, I don’t do much tied to the lunar cycle, besides divinations for myself and for others. NB: the days are numbered from the lunar phase, so that New Moon 1 is the day of the New Moon, not the first day afterward. Not shown above are things that need to be tied to both the lunar phase and weekday, since there’s no way to really show that in either chart (yay interlocking cycles being horrible to map out!). So far, the only big thing I have to worry about with that is maintaining a supply of holy water and consecrated candles, which I constantly go through. The way I do it, I need to time it to the waxing moon (first two weeks of the lunar month) on a Wednesday in order to get a good effect, and also when Mercury isn’t retrograde. Also, I like to do a general reconsecration and cleansing of the tools I use most on a Friday during the waxing moon with a mixture of holy water and Florida water. I’m already using the Sun’s entry into the four cardinal zodiac signs (Aries, Cancer, Libra, Capricorn) to mark the solstices and equinoxes, so it makes sense to me to use the Sun’s halfway point in the four fixed zodiac signs (Aquarius, Taurus, Leo, Scorpio) to mark the cross-quarter days instead of the Gregorian calendrical method. While most other occultists and pagans will use the normal calendrical dating, I’ll stick to my solar dating and tie it to the cycle of the Sun instead. The dates are fairly close, at least, being off no more than a week from the popular observance of them. The period between All Hallow’s Eve and the astrological Samhain is a big deathy week for me that I’ll probably make a big to-do for the dead (the solar eclipse then helps, too). I’ve also included several Jewish festivals into the list, and I want to try getting into more of them (since I am descended from them, after all, but never really raised it). Nothing serious, probably focusing mostly on reading and learning, except for the period between Yom Kippur and Rosh haShanah, which will be just a lil’ more strict on the fasting and self-examination. With this all planned, it’s time to get it copied out onto the calendar and get to Work. Not counting my daily practice, all of the foregoing rituals (conjuration cycle, lunar cycle, and yearly festivals but not including daily practice) amounts to an average of about five hours a week, so even though it sounds complicated and overwhelming, it’s really not. Expect a course calendar for the stuff I’ll be teaching at the local new age store, Sticks and Stones, in the near future, as well!